Vokietijos kompanijos Heidelberg Engineering konfokalinis skanuojntis lazerinis oftalmoskopas su optiniu koherentiniu tomografu Spectralis, Shin Nippon bei OCULUS akių diagnostikos aparatūra. LCD color monitor produces superb colorful display of the icons for easier identification to select your desired choises for measurement . Monitor angle can be tilted in 3 steps that allows confortable operation for both standing and sitting positions . Wide measurement range of Sph – 25.00D to +25.00D , Cyl – 10.00D to + 10.00D . Allows you to measure much smaller pupils than conventional units and 3 step Target light adjuster ensure accurate results . Auto start function allows measuring automatically when alignment meets measurament requirements . 4 plots of cornea can be measured . Quick measurement function realizes 1-10 times countinous measurement by pushing the measurement buttom once . Measured data can be seen on the monitor without printing . * Far pupil distance measurement and near pupil distance calculation. Slit diaphram : 10, 6, 3, 1 and 0,2 mm. Filters : Cobalt blue, heat absorption, 50% neutral density, light blue . Slit rotation : 0° to 180°. Light source : 6V , 27W tungsten lamp. Optional halogen lamp 6V 20W is available . 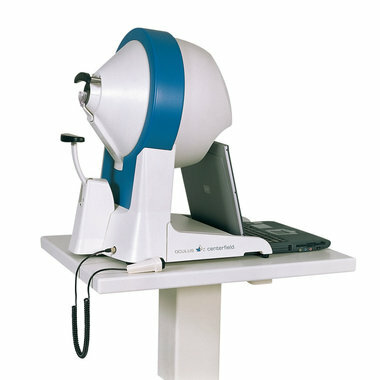 Tonometer : it is possible to use Goldmann Applanation Tonometer T900 or ours . The self-contained measurement system makes examination largely independent of room illumination. Perimetry therefore no longer needs to be carried out in an absolutely dak room. The hardware concept permits easy upgrading in future as well. The intuitive user interface also permits the creation of individual programs and reduces operator training time significantly. Examination up to 70° are possible with fixation shift. The Centerfield 2 will be connected to a USB port. The ergonomic, compact design and the uncomplicated test procedures improve patient compliance and contribute to best possible total results. Integrated chinrest, which will be moved electronically by keyboard operations. The Centerfield 2 is the only compact Perimeter, which examinates up to 70°. All measurement principles in a single device! Numerous threshold strategies, supraliminal and user-defined programs. Automatic examinations on pre-programmed or user-defined meridians. A blue stimulus on a yellow background can be presented in static and kinetic perimetry. Stimulus luminance and size correspond to the Goldmann Standard in static and kinetic perimetry. The unique real threshold test that outperforms most interpolation based algorithms. Fast threshold adapted to surroundings. Minimum of 10 areas/test point grids. Freely definable sectors in the 36°/70° range. Kinetic perimetry: Automatic: Freely selectable meridians, (min. 2°),sectors and speeds, in the 36° range. May be combined with blue and with static programs.